Depending on your organization's inventory approval process, you may be responsible for just approving inventory requests allowing them to move on to the next person for approval, or you may be responsible for approving and issuing the inventory items to the requester. Both processes are outlined below. Users who are only responsible for approving inventory requests and not issuing the items, will use the following steps to process their assigned requests and send them on to the next user in the approval chain. Click on the number under Waiting For Approval on your InventoryDirect home page. On the Process New Requests screen, you will see the first Inventory request that is waiting for your approval. 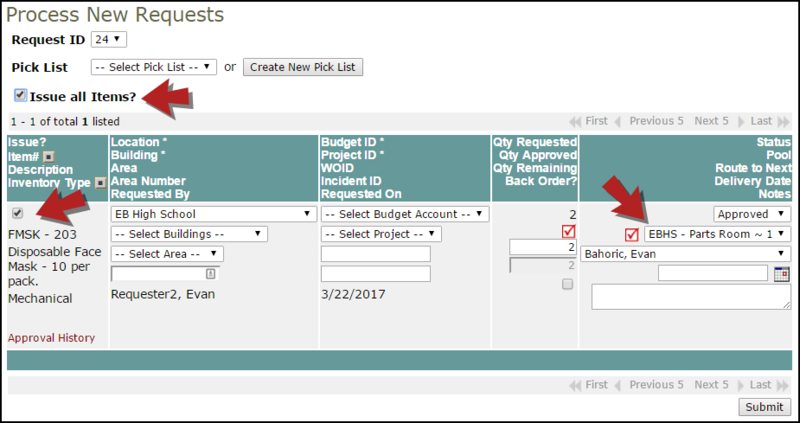 If you would like to process a different request, you can select it from the Request ID drop down list. To approve the request, select Approved in the Status field. *Note: Do not select Yes to Issue Inventory Now if you are not the final person in the approval process. If needed, you may also make changes to the Qty Approved field. Click Submit to approve the request and send it to the next user. The screen will refresh to show the next request needing approval. Users who are responsible for approving and issuing inventory requests, will use the following steps to process their assigned requests. Check the Issue? box. This will automatically change the status of the request to Approved. Check the Issue all Items? box to issue all items requested. Select the Pool from which you are issuing the items and make any other necessary changes to the fields. Click Submit to save the issue transaction(s). 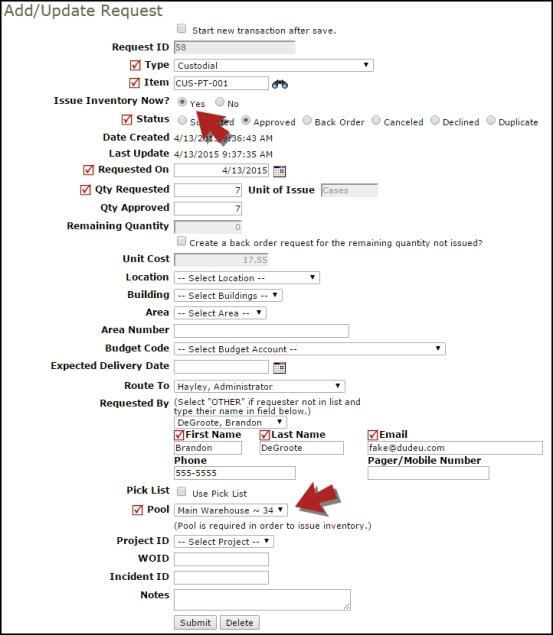 If you do not have enough on-hand inventory to fulfill a request you can create a back order for it. You can put the entire inventory request on back order, or you can partially fulfill the request by issuing some of the inventory now and putting the rest of the requested items on back order. 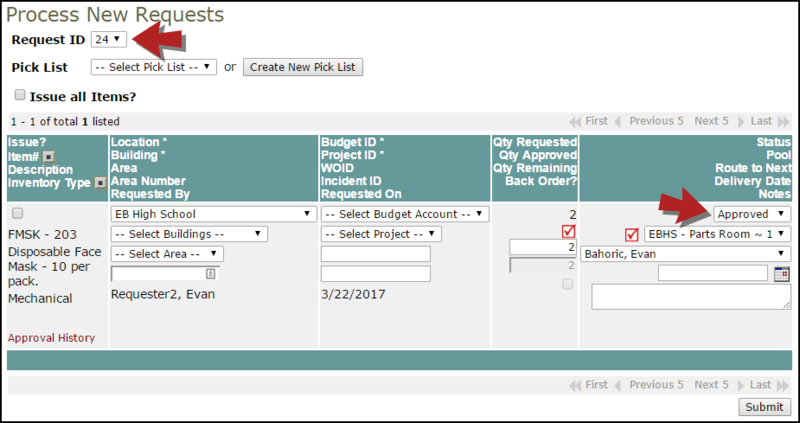 From the Process New Requests screen, select Back Order from the Status drop down field. Click Submit. *Note: Pool is not required when creating a Back Order. Change the number in the Qty Approved box to reflect the amount of items you are issuing now. Check the Back Order? box to create a back order for the remaining quantity. Click Submit to create the partial issue transaction and the back order. In the Waiting for Approval section of the home page, click on the number next to Back Order. This takes you to a list of Back Order requests. Click on the Item Number of the request you would like to process. Select Yes next to Issue Inventory Now? Select the Pool from which you are issuing the inventory.